Sometime ago, our waste management and composting methods attracted attention from none other than Infosys. In all, a team each from Bangalore and Cochin and two teams from two Chennai campuses visited our complex this March. A researcher from the New York University also accompanied the teams. To begin with, they seemed particularly keen on our kitchen waste composting method, but went on to discuss the measures involved in switching over to organic gardening. Above all, they found our secondary segregation of dry waste quite efficient and termed it “among the few best” they had come across. It was nice to exchange notes on cost-effective green initiatives and enrichment of vermi-compost. 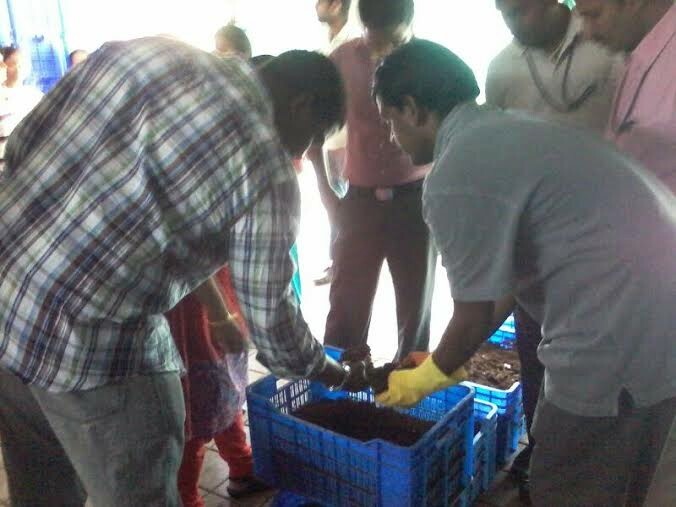 We conducted a demonstration of kitchen waste composting using Up’Grade method and as always, our housekeepers led my Muniraju did an efficient job. This entry was posted in Endlessly Green and tagged composting, Infosys, waste management. Bookmark the permalink. We are planning to stop using pesticides in our community garden. I discussed this with people who are currently using neem oil, but according to them it hasn’t been completely effective. Someone suggested writing to you for advice. Any suggestions will be most appreciated. Thanks. Nice to know about your willingness to shun pesticides.